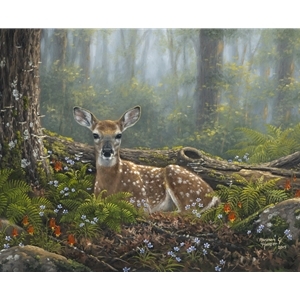 On a misty spring morning deep in a hardwood forest, the early morning light casts its gentle rays through the canopy of leaves and softly illuminates a newborn whitetail fawn. This curious little guy has seen you and is greeting you with his inquisitive stare. His white spotted coat blends in with the dapples of sunlight and the freshly bloomed spring wildflowers. Soon, he will jump up and run off to find his mother. I've tried to capture this precious moment in nature for you to enjoy forever. I hope this Endearing Fawn blesses you with its beauty, and that you never take for granted all that Our Creator has so graciously given us..